Hello! Lawn Fawn Inspiration week is starting to wrap up, only a couple more days left before all of the new release will be available. 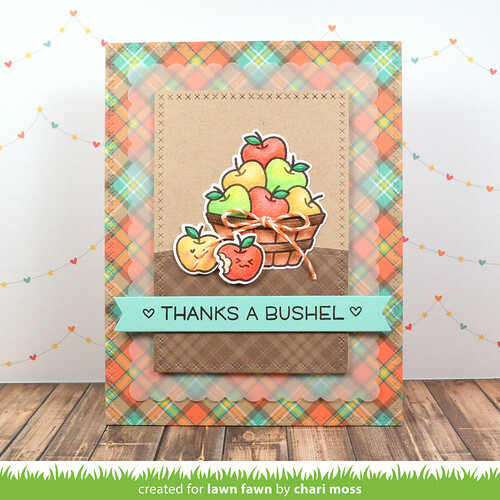 Today we are featuring Thanks A Bushel and Cutie Pie. I colored my apples with colored pencils. I actually recently colored apples in this same way for a video on the Lawn Fawn YouTube channel, you can check that out HERE for more info the coloring. Using the Cross-Stitched Rectangle Stackables I cut some of the Perfectly Plaid Fall paper for the background and the "ground." 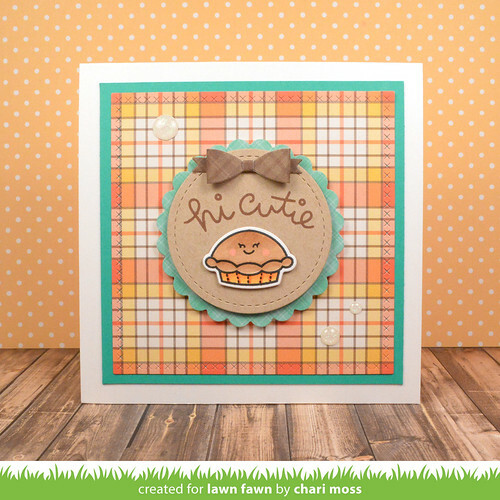 I layered my picture panel over a piece of scalloped die cut vellum to create a softer transition between my two plaids. The sentiment is on a piece of Mermaid cardstock cut with a sentiment banner die. My second card has the pattern paper cut with the Cross-Stitched square stackable. I love that this pattern is very square so I used that as a guide to perfectly line up my die with the pattern. I framed the candy corn plaid with some Peacock cardstock and layered a scalloped circle and stitched circle in the center. The sentiment is stamped with Walnut ink and the cutie pie is colored with copic markers. I finished it off with a tiny bow and some glittery enamel dots. 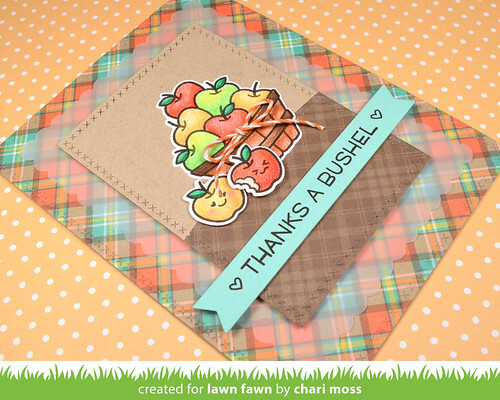 Be sure to check out the Lawn Fawn Blog for more projects with these two mini sets! Oh Chari, you never disappoint! Your cards are so sweet! Love this release as much as the others! I agree with the above comment--your projects are always so great! Well if these cards don't make you smile then I don't know what will! 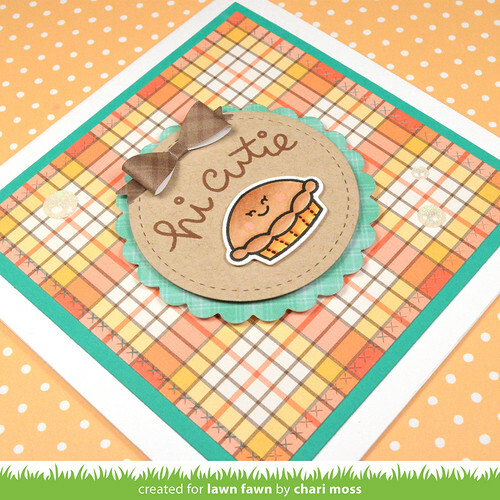 What adorable cards, my fav is the pie with the adorable face and bow. Great job!